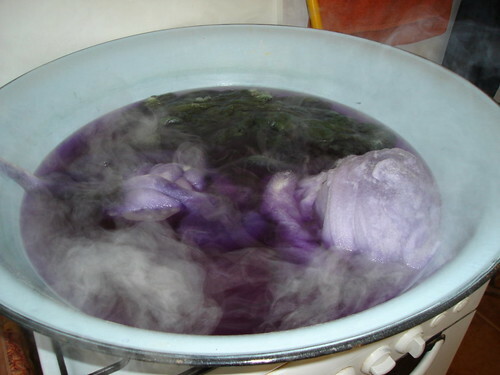 Yesterday I got together with Z and we began the process of dyeing the 10 kgs (22 pounds) of white combed fleece that we had ordered. 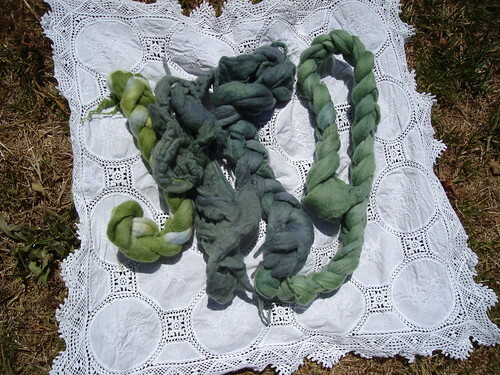 It was my first dyeing experience and I had an absolute tonne of fun. Z owned a yarn store for many years and specialised in hand-dyed yarns, so I really was priviliged to learn from a master. In the bowl are two balls of fleece that I was dyeing while wrapped in the ball. 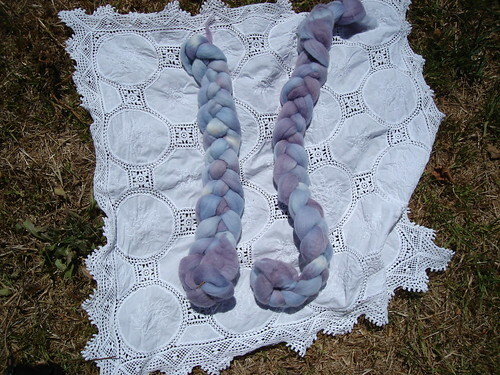 One turned out a beautiful purple and white with a range of shades of purple. The other we over-dyed again scarlet and blue and is just awesome. 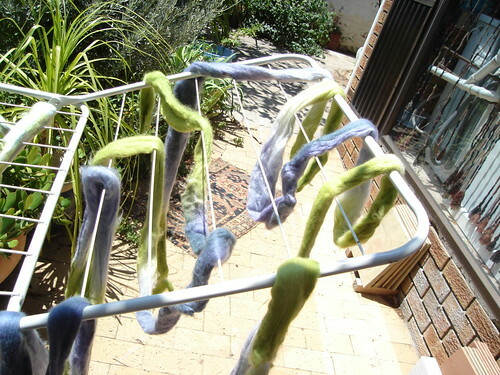 Also in the pot is a green being over-dyed. 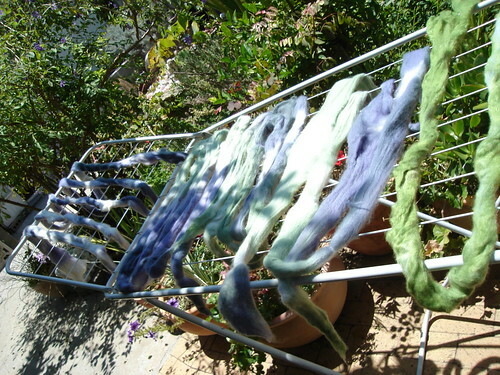 We had a lovely sunny day for drying the fleece. While I was there I took some pictures of Z’s latest WIP to show you. She is recreating her yarn store in miniature – on 12th scale. But that deserves a post all of its own. I had to dash off before the fleece was dry as Gorgeous Man was helping out with a stand for the SABCA at Kirstenbosch Gardens in the afternoon. So I don’t have the fleece here to show you pictures of the entire batch. 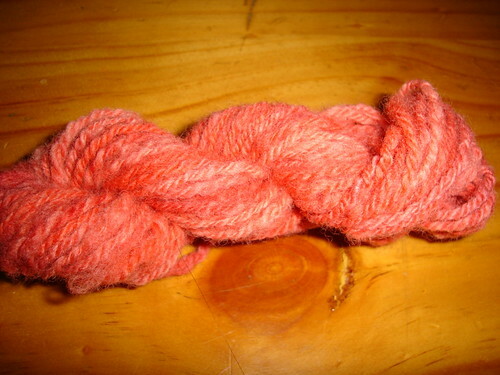 I think all-up we ended up dyeing a kilo and a half. 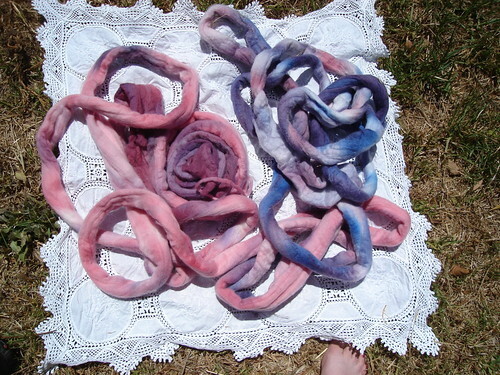 So a whole lot more dyeing and other colourways to try. Just across from the butterfly display at the gardens were people promoting the reptile version of the butterfly project. 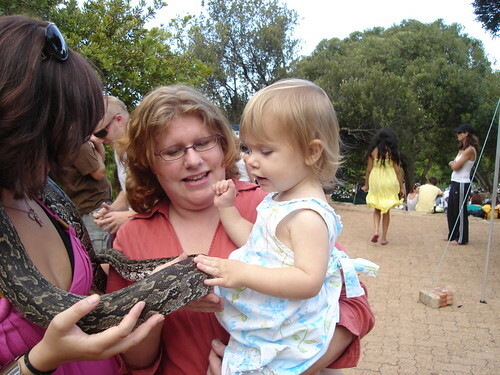 Gorgeous Girl was most taken with the Burmese python. 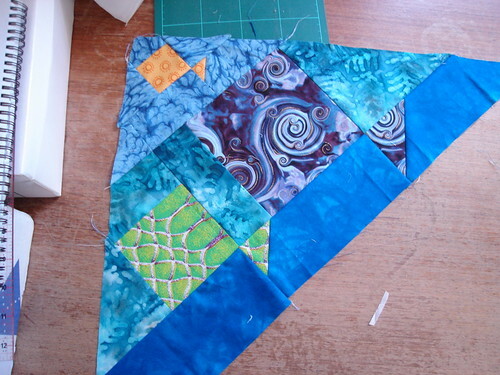 I’ve also added another row to the fish quilt, but won’t inflict row by row pictures on you. Right now Gorgeous Girl is sleeping, so I’m going to try and sneak in my 10 minutes of spinning for the day and some knitting. I didn’t intend to be away from my blog for so long. Gorgeous Man and I have spent the last few weeks getting our work visas renewed. I try to keep my blog a happy place so I will just say that I have told Gorgeous Man that he must have a job in a new country before our work visas are due for renewal in 2012 as I NEVER want to go through that process again. The term drowning in red tape is an understatement. On to happier things. This little jersey arrived at it’s destination, so I can show it now. 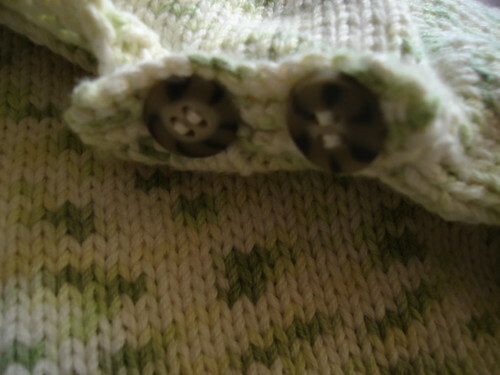 Detail of the buttons and button band. 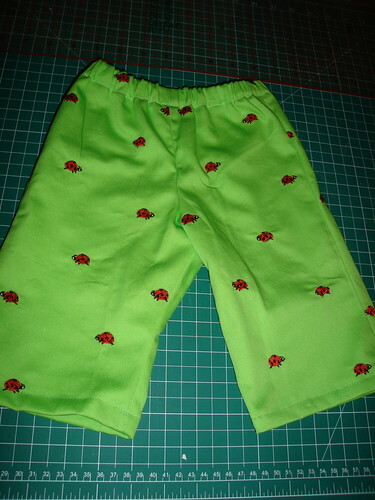 The ladybird pants do fit Gorgeous Girl – though they are a little big in the waist (but they don’t fall down, so it’s all good). The nice thing is that they go perfectly with the top I made here. 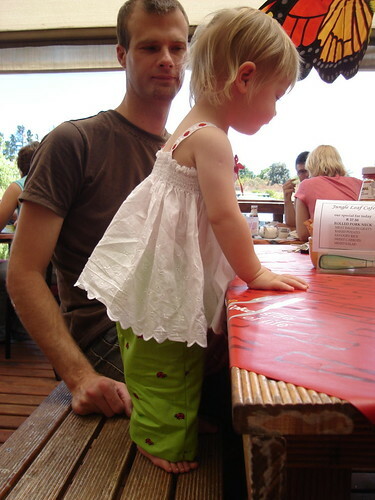 Here she is at the butterfly farm, before she spilled her lunch all over her shirt. There is also a large skein of grey. I watched a YouTube video and then gave it a go. I’m happy with how it turned out. It’s a bit tightly plied in a few areas, but I love the technique and will be doing more. 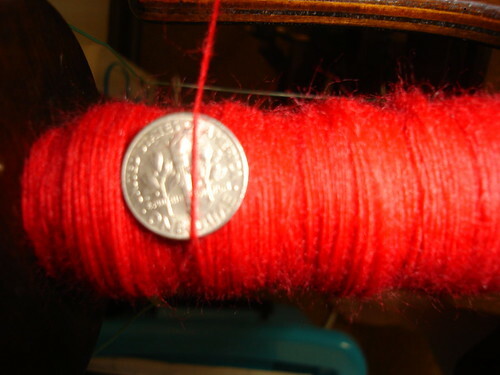 This red merino is what is currently on the wheel. This is my third batch of yarn. I even managed to dig out a US dime for scale. After much consideration I’ve decided that Juno Regina is going to the frog pond. 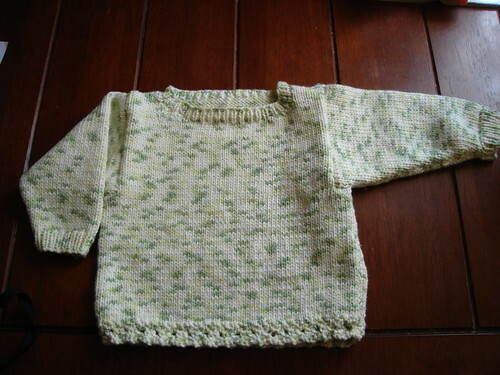 I love the yarn, and I love the pattern, but together they just aren’t doing it for me. 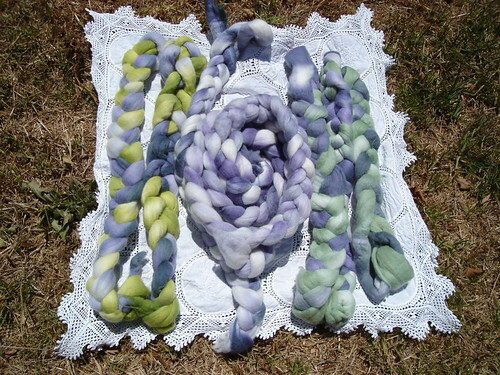 I am going to be dyeing some fleece on Sunday next week, and have plans to dye a purple going from light to dark with some white as well (I can see the roving in my head) and use that for Juno. I have two patterns that I’m going to try out the silk with today if I get time. 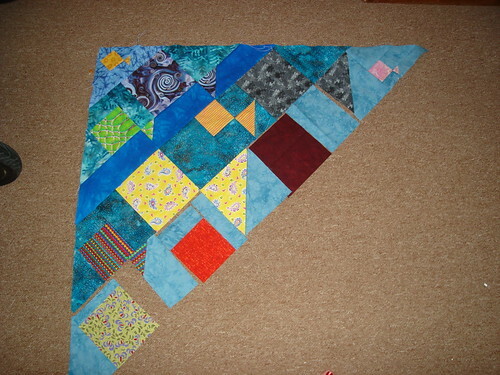 I did get the new quilt cut and the first few rows sewn. The colour is a bit washed out in this picture, but you get the general idea. This is a fish quilt and the pattern comes from one of the Australian Patchwork and Quilting magazines I bought last year. I love that magazine! The scarf for my Scarves for Africa project is coming along nicely. It lives in the car and I do a few rows every time we go somewhere. I had lots of knitting time in the last few week driving the hour there and the hour back from the Department of Home Affairs where we did battle for our visas. Well, I think that sums up the last few weeks, now I’m off to see what you have all been up to! I hope everyone had a Happy New Year’s Day. I don’t have any resolutions for 2009 other than to move more and to spend some time being creative every day. I Thought I’d show you some new things today, what with it being a new year and all. She’s asleep right now, so I can’t try them on her. I picked up the fabric and the pattern at Joanne’s on my trip to San Francisco last year. I had my first attempt at plying. 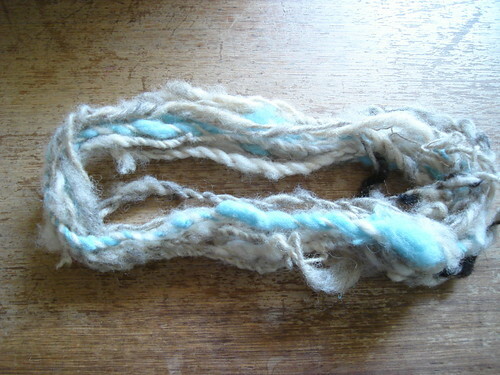 Here is my very first yarn spun on a spindle. This was spun in the grease. 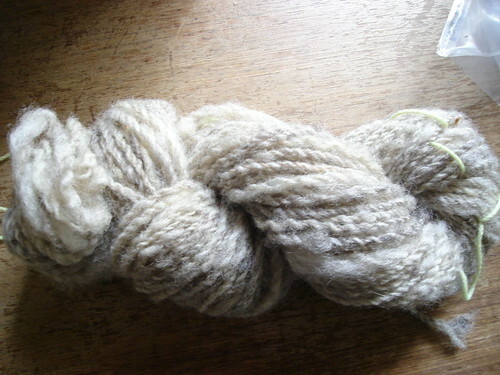 Here is my first ever wheel spun. 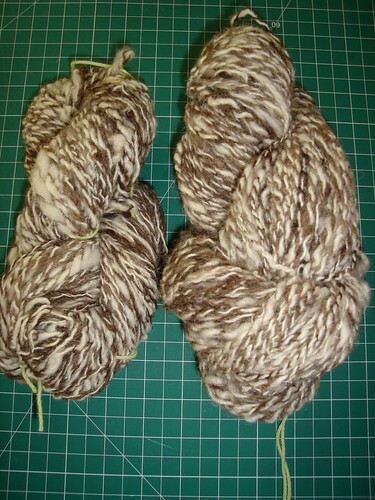 The brown is Jacob and the white is mohair. I also made 3 new scrapbook pages yesterday. I find I sticking bits of paper on a page while Gorgeous Girl is awake, much easier than spinning (little hands like to touch the wheel and stop the spindle) and knitting (where I have to count the pattern). I sorted fabric for a new quilt yesterday as well. It’s kind of complicated, there’s templates and labels and stuff has to be sorted into bags for separate rows. To be honest I’m kind of intimidated and have been avoiding cutting. Today is the day though! It’s going to be a truly international quilt. There’s fabric in it from my trip to the USA, Gorgeous Man’s trip to Canada, and scraps from friends in Finland, and two friends in the UK, as well as South African Fabric. We are taking Gorgeous Girl to visit a butterfly farm/zoo today. Hopefully she’ll enjoy it and there’ll be some good photo opportunities. Ok, off to put rotary cutter to fabric -wish me luck.